Oliver Cromwell (25 April 1599 – 3 September 1658)[a] was an English military and political leader and later Lord Protector of the Commonwealth of England, Scotland, and Ireland. Cromwell was born into the middle gentry, albeit to a family descended from the sister of King Henry VIII's minister Thomas Cromwell. Little is known of the first 40 years of his life as only four of his personal letters survive alongside a summary of a speech he delivered in 1628. He became an Independent Puritan after undergoing a religious conversion in the 1630s, taking a generally tolerant view towards the many Protestant sects of his period. He was an intensely religious man, a self-styled Puritan Moses, and he fervently believed that God was guiding his victories. He was elected Member of Parliament for Huntingdon in 1628 and for Cambridge in the Short (1640) and Long (1640–1649) parliaments. He entered the English Civil War on the side of the "Roundheads" or Parliamentarians. Nicknamed "Old Ironsides", he demonstrated his ability as a commander and was quickly promoted from leading a single cavalry troop to being one of the principal commanders of the New Model Army, playing an important role in the defeat of the royalist forces. On 20 April 1653, he dismissed the Rump Parliament by force, setting up a short-lived nominated assembly known as Barebone's Parliament, before being invited by his fellow leaders to rule as Lord Protector of England (which included Wales at the time), Scotland and Ireland from 16 December 1653. As a ruler, he executed an aggressive and effective foreign policy. He died from natural causes in 1658 and was buried in Westminster Abbey. The Royalists returned to power in 1660, and they had his corpse dug up, hung in chains, and beheaded. Cromwell is one of the most controversial figures in the history of the British Isles, considered a regicidal dictator by historians such as David Sharp, a military dictator by Winston Churchill, but a hero of liberty by John Milton, Thomas Carlyle, and Samuel Rawson Gardiner, and a class revolutionary by Leon Trotsky. In a 2002 BBC poll in Britain, Cromwell, sponsored by military historian Richard Holmes was selected as one of the ten greatest Britons of all time. However, his measures against Catholics in Scotland and Ireland have been characterised as genocidal or near-genocidal, and in Ireland his record is harshly criticised. Cromwell was born in Huntingdon on 25 April 1599 to Robert Cromwell and Elizabeth Steward. He was descended from Katherine Cromwell (born c. 1482), an elder sister of Tudor statesman Thomas Cromwell (c. 1485 – 1540), a leading minister of Henry VIII, whose family acquired considerable wealth by taking over monastery property during the Reformation. Katherine married Morgan ap William, son of William ap Yevan of Wales. The family line continued through Richard Williams, alias Cromwell, (c. 1500–1544), Henry Williams, alias Cromwell, (c. 1524 – 6 January 1604),[b] Henry VIII strongly suggested that the Welsh start using surnames in the English style rather than taking their fathers' names as Morgan ap William and his male ancestors had done. Henry suggested to Sir Richard Williams, who was the first to use a surname in his family, that he use Cromwell, in honour of his uncle Thomas Cromwell. For several generations, the Williams super-added the surname of Cromwell to their own, styling themselves Williams alias Cromwell in legal documents (Noble 1784, pp. 11–13), then to Oliver's father Robert Cromwell (c. 1560–1617), who married Elizabeth Steward (c. 1564 – 1654), probably in 1591. They had ten children, but Oliver, the fifth child, was the only boy to survive infancy. Cromwell was also a distant relation of the Tudor Royal family and through them the Welsh princely family through his descent from Jasper Tudor through his younger daughter, Joan Tudor, as shown in the Genealogy of the Tudors. Jasper was the uncle of Henry VII and great uncle of Henry VIII. Cromwell's paternal grandfather Sir Henry Williams was one of the two wealthiest landowners in Huntingdonshire. Cromwell's father Robert was of modest means but still a part of the gentry class. As a younger son with many siblings, Robert inherited only a house at Huntingdon and a small amount of land. This land would have generated an income of up to £300 a year, near the bottom of the range of gentry incomes. Cromwell himself in 1654 said, "I was by birth a gentleman, living neither in considerable height, nor yet in obscurity". He was baptised on 29 April 1599 at St John's Church, and attended Huntingdon Grammar School. He went on to study at Sidney Sussex College, Cambridge, then a recently founded college with a strong Puritan ethos. He left in June 1617 without taking a degree, immediately after the death of his father. Early biographers claim that he then attended Lincoln's Inn, but the Inn's archives retain no record of him. Fraser (1973) concludes that it was likely that he did train at one of the London Inns of Court during this time. His grandfather, his father, and two of his uncles had attended Lincoln's Inn, and Cromwell sent his son Richard there in 1647. On 22 August 1620 at St Giles-without-Cripplegate, Fore Street, London, Cromwell married Elizabeth Bourchier (1598–1665). Elizabeth's father, Sir James Bourchier, was a London leather merchant who owned extensive lands in Essex and had strong connections with Puritan gentry families there. The marriage brought Cromwell into contact with Oliver St John and with leading members of the London merchant community, and behind them the influence of the Earls of Warwick and Holland. A place in this influential network would prove crucial to Cromwell’s military and political career. Little evidence exists of Cromwell's religion at this stage. His letter in 1626 to Henry Downhall, an Arminian minister, suggests that Cromwell had yet to be influenced by radical puritanism. However, there is evidence that Cromwell went through a period of personal crisis during the late 1620s and early 1630s. In 1628 he was elected to Parliament from the Huntingdonshire county town of Huntingdon. Later that year, he sought treatment for a variety of physical and emotional ailments, including valde melancholicus (depression), from the Swiss-born London doctor Theodore de Mayerne. In 1629 he was caught up in a dispute among the gentry of Huntingdon over a new charter for the town, as a result of which he was called before the Privy Council in 1630. 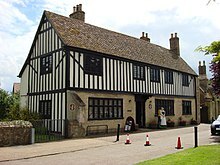 In 1631 Cromwell sold most of his properties in Huntingdon—probably as a result of the dispute—and moved to a farmstead in nearby St Ives (then in Huntingdonshire, now in Cambridgeshire). This signified a major step down in society compared with his previous position, and seems to have had a significant emotional and spiritual impact. A 1638 letter survives from Cromwell to his cousin, the wife of Oliver St John, and gives an account of his spiritual awakening. The letter outlines how, having been "the chief of sinners", Cromwell had been called to be among "the congregation of the firstborn". The language of this letter, which is saturated with biblical quotations and which represents Cromwell as having been saved from sin by God's mercy, places his faith firmly within the Independent beliefs that the Reformation had not gone far enough, that much of England was still living in sin, and that Catholic beliefs and practices needed to be fully removed from the church. Failure to resolve the issues before the Long Parliament led to armed conflict between Parliament and Charles I in late 1642, the beginning of the English Civil War. Before joining Parliament's forces Cromwell's only military experience was in the trained bands, the local county militia. He recruited a cavalry troop in Cambridgeshire after blocking a valuable shipment of silver plate from Cambridge colleges that was meant for the king. Cromwell and his troop then rode to, but arrived too late to take part in, the indecisive Battle of Edgehill on 23 October 1642. The troop was recruited to be a full regiment in the winter of 1642 and 1643, making up part of the Eastern Association under the Earl of Manchester. Cromwell gained experience in a number of successful actions in East Anglia in 1643, notably at the Battle of Gainsborough on 28 July. He was subsequently appointed governor of Ely and a colonel in the Eastern Association. The indecisive outcome of the Second Battle of Newbury in October meant that by the end of 1644 the war still showed no signs of ending. Cromwell's experience at Newbury, where Manchester had let the King's army slip out of an encircling manoeuvre, led to a serious dispute with Manchester, whom he believed to be less than enthusiastic in his conduct of the war. Manchester later accused Cromwell of recruiting men of "low birth" as officers in the army, to which he replied: "If you choose godly honest men to be captains of horse, honest men will follow them ... I would rather have a plain russet-coated captain who knows what he fights for and loves what he knows than that which you call a gentleman and is nothing else". At this time, Cromwell also fell into dispute with Major-General Lawrence Crawford, a Scottish Covenanter Presbyterian attached to Manchester's army, who objected to Cromwell's encouragement of unorthodox Independents and Anabaptists. He was also charged with familism by Scottish Presbyterian Samuel Rutherford in response to his letter to the House of Commons in 1645. Cromwell's differences with the Scots, then allies of the Parliament, developed into outright enmity in 1648 and in 1650–51. Partly in response to the failure to capitalise on their victory at Marston Moor, Parliament passed the Self-Denying Ordinance in early 1645. This forced members of the House of Commons and the Lords, such as Manchester, to choose between civil office and military command. All of them—except Cromwell, whose commission was given continued extensions and was allowed to remain in parliament—chose to renounce their military positions. The Ordinance also decreed that the army be "remodelled" on a national basis, replacing the old county associations; Cromwell contributed significantly to these military reforms. In April 1645 the New Model Army finally took to the field, with Sir Thomas Fairfax in command and Cromwell as Lieutenant-General of cavalry and second-in-command. By this time, the Parliamentarians' field army outnumbered the King's by roughly two to one. At the critical Battle of Naseby in June 1645, the New Model Army smashed the King's major army. Cromwell led his wing with great success at Naseby, again routing the Royalist cavalry. At the Battle of Langport on 10 July, Cromwell participated in the defeat of the last sizeable Royalist field army. Naseby and Langport effectively ended the King's hopes of victory, and the subsequent Parliamentarian campaigns involved taking the remaining fortified Royalist positions in the west of England. In October 1645, Cromwell besieged and took the wealthy and formidable Catholic fortress Basing House, later to be accused of killing 100 of its 300-man Royalist garrison after its surrender. Cromwell also took part in successful sieges at Bridgwater, Sherborne, Bristol, Devizes, and Winchester, then spent the first half of 1646 mopping up resistance in Devon and Cornwall. Charles I surrendered to the Scots on 5 May 1646, effectively ending the First English Civil War. Cromwell and Fairfax took the formal surrender of the Royalists at Oxford in June. Many in the army, such as the Levellers led by John Lilburne, thought this was not enough and demanded full political equality for all men, leading to tense debates in Putney during the autumn of 1647 between Fairfax, Cromwell and Ireton on the one hand, and radical Levellers like Colonel Rainsborough on the other. The Putney Debates ultimately broke up without reaching a resolution. The debates, and the escape of Charles I from Hampton Court on 12 November, are likely to have hardened Cromwell's resolve against the king. During 1648, Cromwell's letters and speeches started to become heavily based on biblical imagery, many of them meditations on the meaning of particular passages. For example, after the battle of Preston, study of Psalms 17 and 105 led him to tell Parliament that "they that are implacable and will not leave troubling the land may be speedily destroyed out of the land". A letter to Oliver St John in September 1648 urged him to read Isaiah 8, in which the kingdom falls and only the godly survive. On four occasions in letters in 1648 he referred to the story of Gideon's defeat of the Midianites at Ain Harod. These letters suggest that it was Cromwell's faith, rather than a commitment to radical politics, coupled with Parliament's decision to engage in negotiations with the king at the Treaty of Newport, that convinced him that God had spoken against both the king and Parliament as lawful authorities. For Cromwell, the army was now God's chosen instrument. The episode shows Cromwell’s firm belief in "Providentialism"—that God was actively directing the affairs of the world, through the actions of "chosen people" (whom God had "provided" for such purposes). Cromwell believed, during the Civil Wars, that he was one of these people, and he interpreted victories as indications of God's approval of his actions, and defeats as signs that God was directing him in another direction. In December 1648, those Members of Parliament who wished to continue negotiations with the king were prevented from sitting for parliament[clarification needed] by a troop of soldiers headed by Colonel Thomas Pride, an episode soon to be known as Pride's Purge. Thus weakened, the remaining body of MPs, known as the Rump, agreed that Charles should be tried on a charge of treason. Cromwell was still in the north of England, dealing with Royalist resistance, when these events took place, but then returned to London. On the day after Pride's Purge, he became a determined supporter of those pushing for the king's trial and execution, believing that killing Charles was the only way to end the civil wars. Cromwell approved Thomas Brook's address to the House of Commons, which justified the trial and execution of the King on the basis of the Book of Numbers, chapter 35 and particularly verse 33 ("The land cannot be cleansed of the blood that is shed therein, but by the blood of him that shed it."). The death warrant for Charles was eventually signed by 59 of the trying court's members, including Cromwell (who was the third to sign it). Though it was not unprecedented, execution of the king, or "regicide", was controversial, if for no other reason due to the doctrine of the divine right of kings. "...an attack on a king by one of his own subjects was taken to amount to a direct challenge to the monarch, to his divine right to rule, and thus to God's will." Fairfax conspicuously refused to sign. Charles I was executed on 30 January 1649. After the execution of the King, a republic was declared, known as the "Commonwealth of England". The "Rump Parliament" exercised both executive and legislative powers, with a smaller Council of State also having some executive functions. Cromwell remained a member of the "Rump" and was appointed a member of the Council. In the early months after the execution of Charles I, Cromwell tried but failed to unite the original group of "Royal Independents" centred around St John and Saye and Sele, which had fractured during 1648. Cromwell had been connected to this group since before the outbreak of civil war in 1642 and had been closely associated with them during the 1640s. However, only St John was persuaded to retain his seat in Parliament. The Royalists, meanwhile, had regrouped in Ireland, having signed a treaty with the Irish known as "Confederate Catholics". In March, Cromwell was chosen by the Rump to command a campaign against them. Preparations for an invasion of Ireland occupied Cromwell in the subsequent months. In the latter part of the 1640s, Cromwell came across political dissidence in his "New Model Army". The "Leveller" or "Agitator" movement was a political movement that emphasised popular sovereignty, extended suffrage, equality before the law, and religious tolerance. These sentiments were expressed in the manifesto "Agreement of the People" in 1647. Cromwell and the rest of the "Grandees" disagreed with these sentiments in that they gave too much freedom to the people; they believed that the vote should only extend to the landowners. In the "Putney Debates" of 1647, the two groups debated these topics in hopes of forming a new constitution for England. There were rebellions and mutinies following the debates, and in 1649, the Bishopsgate mutiny resulted in the execution of Leveller Robert Lockyer by firing squad. The next month, the Banbury mutiny occurred with similar results. Cromwell led the charge in quelling these rebellions. After quelling Leveller mutinies within the English army at Andover and Burford in May, Cromwell departed for Ireland from Bristol at the end of July. Cromwell's hostility to the Irish was religious as well as political. He was passionately opposed to the Catholic Church, which he saw as denying the primacy of the Bible in favour of papal and clerical authority, and which he blamed for suspected tyranny and persecution of Protestants in Europe. Cromwell's association of Catholicism with persecution was deepened with the Irish Rebellion of 1641. This rebellion, although intended to be bloodless, was marked by massacres of English and Scottish Protestant settlers by Irish ("Gaels") and Old English in Ireland, and Highland Scot Catholics in Ireland. These settlers had settled on land seized from former, native Catholic owners to make way for the non-native Protestants. These factors contributed to the brutality of the Cromwell military campaign in Ireland. I am persuaded that this is a righteous judgment of God upon these barbarous wretches, who have imbrued their hands in so much innocent blood and that it will tend to prevent the effusion of blood for the future, which are satisfactory grounds for such actions, which otherwise cannot but work remorse and regret"
At the Siege of Wexford in October, another massacre took place under confused circumstances. While Cromwell was apparently trying to negotiate surrender terms, some of his soldiers broke into the town, killed 2,000 Irish troops and up to 1,500 civilians, and burned much of the town. No disciplinary actions were taken against his forces subsequent to this second massacre. In the wake of the Commonwealth's conquest of the island of Ireland, the public practice of Catholicism was banned and Catholic priests were killed when captured. All Catholic-owned land was confiscated under the Act for the Settlement of Ireland of 1652 and given to Scottish and English settlers, Parliament's financial creditors and Parliamentary soldiers. The remaining Catholic landowners were allocated poorer land in the province of Connacht. Under the Commonwealth, Catholic landownership dropped from 60% of the total to just 8%. The extent of Cromwell's brutality in Ireland has been strongly debated. Some historians argue that Cromwell never accepted that he was responsible for the killing of civilians in Ireland, claiming that he had acted harshly but only against those "in arms". Other historians, however, cite Cromwell's contemporary reports to London including that of 27 September 1649 in which he lists the slaying of 3,000 military personnel, followed by the phrase "and many inhabitants". In September 1649, he justified his sacking of Drogheda as revenge for the massacres of Protestant settlers in Ulster in 1641, calling the massacre "the righteous judgement of God on these barbarous wretches, who have imbrued their hands with so much innocent blood." However, Drogheda had never been held by the rebels in 1641—many of its garrison were in fact English royalists. On the other hand, the worst atrocities committed in Ireland, such as mass evictions, killings and deportation of over 50,000 men, women and children as prisoners of war and indentured servants to Bermuda and Barbados, were carried out under the command of other generals after Cromwell had left for England. However, other historians[who? ]would argue that ultimately he was the commander of these generals. Some point to his actions on entering Ireland. Cromwell demanded that no supplies were to be seized from the civilian inhabitants and that everything should be fairly purchased; "I do hereby warn....all Officers, Soldiers and others under my command not to do any wrong or violence toward Country People or any persons whatsoever, unless they be actually in arms or office with the enemy.....as they shall answer to the contrary at their utmost peril." However, it should be noted that he landed in Dublin, a city with no Catholic population as they had been previously expelled. The massacres at Drogheda and Wexford were in some ways typical of the day, especially in the context of the recently ended Thirty Years War, although there are few comparable incidents during the Civil Wars in England or Scotland, which were fought mainly between Protestant adversaries, albeit of differing denominations. One possible comparison is Cromwell's Siege of Basing House in 1645—the seat of the prominent Catholic the Marquess of Winchester—which resulted in about 100 of the garrison of 400 being killed after being refused quarter. Contemporaries also reported civilian casualties, six Catholic priests and a woman. However, the scale of the deaths at Basing House was much smaller. Cromwell himself said of the slaughter at Drogheda in his first letter back to the Council of State: "I believe we put to the sword the whole number of the defendants. I do not think thirty of the whole number escaped with their lives." Cromwell's orders—"in the heat of the action, I forbade them to spare any that were in arms in the town"—followed a request for surrender at the start of the siege, which was refused. The military protocol of the day was that a town or garrison that rejected the chance to surrender was not entitled to quarter. The refusal of the garrison at Drogheda to do this, even after the walls had been breached, was to Cromwell justification for the massacre. Where Cromwell negotiated the surrender of fortified towns, as at Carlow, New Ross, and Clonmel, some historians[who?] argue that he respected the terms of surrender and protected the lives and property of the townspeople. At Wexford, Cromwell again began negotiations for surrender. However, the captain of Wexford castle surrendered during the middle of the negotiations, and in the confusion some of his troops began indiscriminate killing and looting. By the end of the Cromwellian campaign and settlement there had been extensive dispossession of landowners who were Catholic, and a huge drop in population. 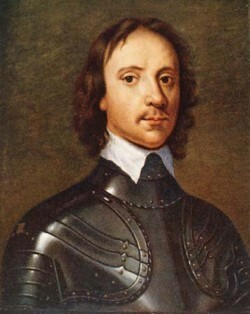 Although Cromwell's time spent on campaign in Ireland was limited, and although he did not take on executive powers until 1653, he is often the central focus of wider debates about whether, as historians such as Mark Levene and John Morrill suggest, the Commonwealth conducted a deliberate programme of ethnic cleansing in Ireland. Faced with the prospect of an Irish alliance with Charles II, Cromwell carried out a series of massacres to subdue the Irish. Then, once Cromwell had returned to England, the English Commissary, General Henry Ireton, adopted a deliberate policy of crop burning and starvation, which was responsible for the majority of an estimated 600,000 deaths out of a total Irish population of 1,400,000. A key surviving statement of Cromwell's own views on the conquest of Ireland is his Declaration of the lord lieutenant of Ireland for the undeceiving of deluded and seduced people of January 1650. In this he was scathing about Catholicism, saying that "I shall not, where I have the power... suffer the exercise of the Mass." However, he also declared that: "as for the people, what thoughts they have in the matter of religion in their own breasts I cannot reach; but I shall think it my duty, if they walk honestly and peaceably, not to cause them in the least to suffer for the same." Private soldiers who surrendered their arms "and shall live peaceably and honestly at their several homes, they shall be permitted so to do." As with many incidents in Cromwell's career, there is debate about the extent of his sincerity in making these public statements: the Rump Parliament's later Act of Settlement of 1652 set out a much harsher policy of execution and confiscation of property of anyone who had supported the uprisings. The following year, Charles II and his Scottish allies made a desperate attempt to invade England and capture London while Cromwell was engaged in Scotland. Cromwell followed them south and caught them at Worcester on 3 September 1651. At the subsequent Battle of Worcester, Cromwell's forces destroyed the last major Scottish Royalist army. Charles II barely escaped capture, and subsequently fled to exile in France and the Netherlands, where he would remain until 1660. Many of the Scottish prisoners of war taken in the campaigns died of disease, and others were sent as indentured labourers to the colonies. To fight the battle, Cromwell organised an envelopment followed by a multi pronged coordinated attack on Worcester which involved his forces attacking from three directions with two rivers partitioning his force. During the battle, Cromwell switched his reserves from one side of the river Severn to the other and back again. The editor of the Great Rebellion article of the Encyclopædia Britannica (eleventh edition) noted that compared to the early Civil War Battle of Turnham Green, Worcester was a battle of manoeuvre, which the English parliamentary armies at the start of the war were unable to execute, and agreed with a German critic that it was a prototype for the Battle of Sedan (1870). In the final stages of the Scottish campaign, Cromwell's men, under George Monck, sacked Dundee, killing up to 1,000 men and 140 women and children. During the Commonwealth, Scotland was ruled from England, and was kept under military occupation, with a line of fortifications sealing off the Highlands, which had provided manpower for Royalist armies in Scotland, from the rest of the country. The north west Highlands was the scene of another pro-royalist uprising in 1653–55, which was only put down with deployment of 6,000 English troops there. 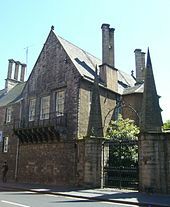 Presbyterianism was allowed to be practised as before, but the Kirk (the Scottish church) did not have the backing of the civil courts to impose its rulings, as it had previously. Cromwell's conquest, unwelcome as it was, left no significant lasting legacy of bitterness in Scotland. The rule of the Commonwealth and Protectorate was, the Highlands aside, largely peaceful. Moreover, there were no wholesale confiscations of land or property. Three out of every four Justices of the Peace in Commonwealth Scotland were Scots and the country was governed jointly by the English military authorities and a Scottish Council of State. Although not often favourably regarded, Cromwell's name rarely meets the hatred in Scotland that it does in Ireland. From the middle of 1649 until 1651 Cromwell was away on campaign. In the meantime, with the king gone (and with him their common cause), the various factions in Parliament began to engage in infighting. On his return, Cromwell tried to galvanise the Rump into setting dates for new elections, uniting the three kingdoms under one polity, and to put in place a broad-brush, tolerant national church. However, the Rump vacillated in setting election dates, and although it put in place a basic liberty of conscience, it failed to produce an alternative for tithes or dismantle other aspects of the existing religious settlement. In frustration, in April 1653 Cromwell demanded that the Rump establish a caretaker government of 40 members (drawn both from the Rump and the army) and then abdicate. However, the Rump returned to debating its own bill for a new government. Cromwell was so angered by this that on 20 April 1653, supported by about forty musketeers, he cleared the chamber and dissolved the Parliament by force. Several accounts exist of this incident: in one, Cromwell is supposed to have said "you are no Parliament, I say you are no Parliament; I will put an end to your sitting". At least two accounts agree that Cromwell snatched up the mace, symbol of Parliament's power, and demanded that the "bauble" be taken away. Cromwell's troops were commanded by Charles Worsley, later one of his Major Generals and one of his most trusted advisors, to whom he entrusted the mace. After the dissolution of the Rump, power passed temporarily to a council that debated what form the constitution should take. They took up the suggestion of Major-General Thomas Harrison for a "sanhedrin" of saints. Although Cromwell did not subscribe to Harrison's apocalyptic, Fifth Monarchist beliefs—which saw a sanhedrin as the starting point for Christ's rule on earth—he was attracted by the idea of an assembly made up of men chosen for their religious credentials. In his speech at the opening of the assembly on 4 July 1653, Cromwell thanked God’s providence that he believed had brought England to this point and set out their divine mission: "truly God hath called you to this work by, I think, as wonderful providences as ever passed upon the sons of men in so short a time." Sometimes known as the Parliament of Saints or more commonly the Nominated Assembly, it was also called Barebone's Parliament after one of its members, Praise-God Barebone. The assembly was tasked with finding a permanent constitutional and religious settlement (Cromwell was invited to be a member but declined). However, the revelation that a considerably larger segment of the membership than had been believed were the radical Fifth Monarchists led to its members voting to dissolve it on 12 December 1653, out of fear of what the radicals might do if they took control of the Assembly. After the dissolution of the Barebones Parliament, John Lambert put forward a new constitution known as the Instrument of Government, closely modelled on the Heads of Proposals. It made Cromwell Lord Protector for life to undertake “the chief magistracy and the administration of government”. Cromwell was sworn in as Lord Protector on 16 December 1653, with a ceremony in which he wore plain black clothing, rather than any monarchical regalia. However, from this point on Cromwell signed his name 'Oliver P', the P being an abbreviation for Protector, which was similar to the style of monarchs who used an R to mean Rex or Regina, and it soon became the norm for others to address him as "Your Highness". As Protector, he had the power to call and dissolve parliaments but was obliged under the Instrument to seek the majority vote of a Council of State. Nevertheless, Cromwell's power was buttressed by his continuing popularity among the army. As the Lord Protector he was paid £100,000 a year. Cromwell famously stressed the quest to restore order in his speech to the first Protectorate parliament at its inaugural meeting on 3 September 1654. He declared that "healing and settling" were the "great end of your meeting". However, the Parliament was quickly dominated by those pushing for more radical, properly republican reforms. After some initial gestures approving appointments previously made by Cromwell, the Parliament began to work on a radical programme of constitutional reform. Rather than opposing Parliament’s bill, Cromwell dissolved them on 22 January 1655. The First Protectorate Parliament had a property franchise of £200 per annum in real or personal property value set as the minimum value in which a male adult was to possess before he was eligible to vote for the representatives from the counties or shires in the House of Commons. The House of Commons representatives from the boroughs were elected by the burgesses or those borough residents who had the right to vote in municipal elections, and by the aldermen and councilors of the boroughs. As Lord Protector, Cromwell was aware of the Jewish community's involvement in the economics of the Netherlands, now England's leading commercial rival. It was this—allied to Cromwell's tolerance of the right to private worship of those who fell outside evangelical Puritanism—that led to his encouraging Jews to return to England in 1657, over 350 years after their banishment by Edward I, in the hope that they would help speed up the recovery of the country after the disruption of the Civil Wars. There was a longer-term motive for Cromwell's decision to allow the Jews to return to England, and that was the hope that they would convert to Christianity and therefore hasten the Second Coming of Jesus Christ, ultimately based on Matthew 23:37–39 and Romans 11. At the Whitehall conference of December 1655 he quoted from St. Paul's Epistle to the Romans 10:12–15 on the need to send Christian preachers to the Jews. Cromwell's long-term religious motive for readmitting the Jews to England should not be doubted, after all he was serious enough to ban Christmas as a pagan festival. William Prynne the Presbyterian, in contrast to Cromwell the Congregationalist, was strongly opposed to the latter's pro-Jewish policy. In 1657, Cromwell was offered the crown by Parliament as part of a revised constitutional settlement, presenting him with a dilemma since he had been "instrumental" in abolishing the monarchy. Cromwell agonised for six weeks over the offer. He was attracted by the prospect of stability it held out, but in a speech on 13 April 1657 he made clear that God's providence had spoken against the office of king: “I would not seek to set up that which Providence hath destroyed and laid in the dust, and I would not build Jericho again”. The reference to Jericho harks back to a previous occasion on which Cromwell had wrestled with his conscience when the news reached England of the defeat of an expedition against the Spanish-held island of Hispaniola in the West Indies in 1655—comparing himself to Achan, who had brought the Israelites defeat after bringing plunder back to camp after the capture of Jericho. 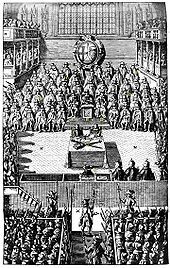 Instead, Cromwell was ceremonially re-installed as Lord Protector on 26 June 1657 at Westminster Hall, sitting upon King Edward's Chair, which was moved specially from Westminster Abbey for the occasion. The event in part echoed a coronation, using many of its symbols and regalia, such as a purple ermine-lined robe, a sword of justice and a sceptre (but not a crown or an orb). But, most notably, the office of Lord Protector was still not to become hereditary, though Cromwell was now able to nominate his own successor. Cromwell's new rights and powers were laid out in the Humble Petition and Advice, a legislative instrument which replaced the Instrument of Government. Despite failing to restore the Crown, this new constitution did set up many of the vestiges of the ancient constitution including a house of life peers (in place of the House of Lords). In the Humble Petition it was called the Other House as the Commons could not agree on a suitable name. Furthermore, Oliver Cromwell increasingly took on more of the trappings of monarchy. In particular, he created two baronages after the acceptance of the Humble Petition and Advice—Charles Howard was made Viscount Morpeth and Baron Gisland in July 1657 and Edmund Dunch was created Baron Burnell of East Wittenham in April 1658. Cromwell, however, was at pains to minimise his role, describing himself as a constable or watchman. Cromwell is thought to have suffered from malaria and from "stone", a common term for urinary/kidney infections. In 1658 he was struck by a sudden bout of malarial fever, followed directly by illness symptomatic of a urinary or kidney complaint. The Venetian ambassador, who wrote regular dispatches to the Doge of Venice in which he included details of Cromwell's final illness, was suspicious of the rapidity of Cromwell's death. The decline may also have been hastened by the death of one of his daughters, Elizabeth Claypole, in August. He died aged 59 at Whitehall on Friday 3 September 1658, the anniversary of his great victories at Dunbar and Worcester. The most likely cause of Cromwell's death was septicaemia following his urinary infection. He was buried with great ceremony, with an elaborate funeral based on that of James I, at Westminster Abbey, his daughter Elizabeth also being buried there. He was succeeded as Lord Protector by his son Richard. Although not entirely without ability, Richard had no power base in either Parliament or the Army, and was forced to resign in May 1659, ending the Protectorate. There was no clear leadership from the various factions that jostled for power during the short-lived reinstated Commonwealth, so George Monck, the English governor of Scotland, at the head of New Model Army regiments was able to march on London, and restore the Long Parliament. Under Monck's watchful eye the necessary constitutional adjustments were made so that in 1660 Charles II could be invited back from exile to be king under a restored monarchy. 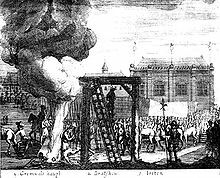 On 30 January 1661 (the 12th anniversary of the execution of Charles I), Cromwell's body was exhumed from Westminster Abbey, and was subjected to a posthumous execution, as were the remains of Robert Blake, John Bradshaw and Henry Ireton. (The body of Cromwell's daughter was allowed to remain buried in the Abbey.) His disinterred body was hanged in chains at Tyburn, and then thrown into a pit. Cromwell's severed head was displayed on a pole outside Westminster Hall until 1685. Afterwards it allegedly was owned by various people, including a documented sale in 1814 to Josiah Henry Wilkinson, and was publicly exhibited several times before being buried beneath the floor of the antechapel at Sidney Sussex College, Cambridge, in 1960. The exact position was not publicly disclosed, but a plaque marks the approximate location. Many people began to question whether the body mutilated at Tyburn was Cromwell's. These doubts arose because it was assumed that between his death in September 1658 and the exhumation of January 1661, Cromwell's body was buried and reburied in several places to protect it from vengeful royalists. The stories suggest that his bodily remains are buried in London, Cambridgeshire, Northamptonshire or Yorkshire. The Cromwell vault was later used as a burial place for Charles II's illegitimate descendants. In Westminster Abbey, the site of Cromwell’s burial was marked during the 19th century by a floor stone in what is now the Air Force Chapel, reading "The burial place of Oliver Cromwell 1658–1661". During his lifetime, some tracts painted him as a hypocrite motivated by power—for example, The Machiavilian Cromwell and The Juglers Discovered, both part of an attack on Cromwell by the Levellers after 1647, present him as a Machiavellian figure. In a more positive contemporary assessment, John Spittlehouse in A Warning Piece Discharged—compared him to Moses, rescuing the English by taking them safely through the Red Sea of the civil wars. The poet and polemicist John Milton called Cromwell "our chief of men" in his Sonnet XVI, and in works like Defensio secunda, defended the Republic and the Lord Protector, while exhorting him to remain true to the principles of the Revolution. Several biographies were published soon after his death. An example is The Perfect Politician, which described how Cromwell "loved men more than books" and gave a nuanced assessment of him as an energetic campaigner for liberty of conscience brought down by pride and ambition. An equally nuanced but less positive assessment was published in 1667 by Edward Hyde, 1st Earl of Clarendon, in his History of the Rebellion and Civil Wars in England. Clarendon famously declared that Cromwell "will be looked upon by posterity as a brave bad man". He argued that Cromwell's rise to power had been helped not only by his great spirit and energy, but also by his ruthlessness. Clarendon was not one of Cromwell's confidantes, and his account was written after the Restoration of the monarchy. During the early 18th century, Cromwell's image began to be adopted and reshaped by the Whigs, as part of a wider project to give their political objectives historical legitimacy. A version of Edmund Ludlow’s Memoirs, re-written by John Toland to excise the radical Puritanical elements and replace them with a Whiggish brand of republicanism, presented the Cromwellian Protectorate as a military tyranny. Through Ludlow, Toland portrayed Cromwell as a despot who crushed the beginnings of democratic rule in the 1640s. During the early 19th century, Cromwell began to be portrayed in a positive light by Romantic artists and poets. Thomas Carlyle continued this reassessment of Cromwell in the 1840s, publishing an annotated collection of Cromwell's letters and speeches in which he described English Puritanism as "the last of all our Heroisms" while taking a negative view of his own era. By the late 19th century, Carlyle's portrayal of Cromwell, stressing the centrality of puritan morality and earnestness, had become assimilated into Whig and Liberalhistoriography. The Oxford civil war historian Samuel Rawson Gardiner concluded that "the man—it is ever so with the noblest—was greater than his work". Gardiner stressed Cromwell’s dynamic and mercurial character, and his role in dismantling absolute monarchy, while underestimating Cromwell’s religious conviction. Cromwell’s foreign policy also provided an attractive forerunner of Victorian imperial expansion, with Gardiner stressing his “constancy of effort to make England great by land and sea”. During the first half of the 20th century, Cromwell's reputation was often influenced by the rise of fascism in Nazi Germany and in Italy. Wilbur Cortez Abbott, for example—a Harvard historian—devoted much of his career to compiling and editing a multi-volume collection of Cromwell's letters and speeches. In this work, which was published between 1937 and 1947, Abbott began to argue that Cromwell was a proto-fascist. However, subsequent historians such as John Morrill have criticised both Abbott's interpretation of Cromwell and his editorial approach. Ernest Barker similarly compared the Independents to the Nazis. Nevertheless, not all historical comparisons made at this time drew on contemporary military dictators. Late 20th century historians re-examined the nature of Cromwell's faith and of his authoritarian regime. Austin Woolrych explored the issue of "dictatorship" in depth, arguing that Cromwell was subject to two conflicting forces: his obligation to the army and his desire to achieve a lasting settlement by winning back the confidence of the political nation as a whole. 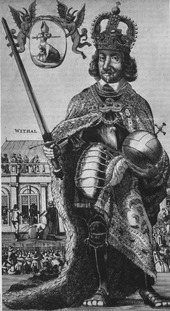 Woolrych argued that the dictatorial elements of Cromwell's rule stemmed not so much from its military origins or the participation of army officers in civil government, as from his constant commitment to the interest of the people of God and his conviction that suppressing vice and encouraging virtue constituted the chief end of government. Historians such as John Morrill, Blair Worden and J. C. Davis have developed this theme, revealing the extent to which Cromwell’s writing and speeches are suffused with biblical references, and arguing that his radical actions were driven by his zeal for godly reformation. In 1776, one of the first ships commissioned to serve in the Continental Navy during the American Revolutionary War was named Oliver Cromwell. 19th century engineer Sir Richard Tangye was a noted Cromwell enthusiast and collector of Cromwell manuscripts and memorabilia. His collection included many rare manuscripts and printed books, medals, paintings, objects d'art and a bizarre assemblage of "relics." This includes Cromwell's bible, button, coffin plate, death mask and funeral escutcheon. On Tangye's death, the entire collection was donated to the Museum of London, where it can still be seen. In 1875 a statue of Cromwell by Matthew Noble was erected in Manchester outside the cathedral, a gift to the city by Mrs. Abel Heywood in memory of her first husband. It was the first such large-scale statue to be erected in the open in England and was a realistic likeness, based on the painting by Peter Lely and showing Cromwell in battledress with drawn sword and leather body armour. The statue was unpopular with local Conservatives and the large Irish immigrant population. When Queen Victoria was invited to open the new Manchester Town Hall, she is alleged to have consented on condition that the statue of Cromwell be removed. The statue remained, Victoria declined, and the town hall was instead opened by the Lord Mayor. During the 1980s the statue was relocated outside Wythenshawe Hall, which had been occupied by Cromwell's troops. During the 1890s plans to erect a statue of Cromwell outside Parliament also proved to be controversial. Pressure from the Irish Nationalist Party forced the withdrawal of a motion to seek public funding for the project, and though the statue was eventually erected, it had to be funded privately by Lord Rosebery. Cromwell controversy continued into the 20th century. As First Lord of the Admiralty before the First World War, Winston Churchill twice suggested naming a British battleship HMS Oliver Cromwell. The suggestion was vetoed by King George V, not only because of his personal feelings but because he felt, given the anger caused by the erection of the statue outside Parliament, to give such a name to an expensive warship at a time of Irish political unrest was unwise. Churchill was eventually told by the First Sea Lord Admiral Battenberg that the king's decision must be treated as final. The Cromwell Tank, a British Second World War medium weight tank first used in 1944, and a steam locomotive built by British Railways in 1951, 70013 Oliver Cromwell, were both named after Cromwell. 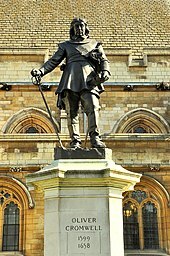 Other public statues of Cromwell are located in St Ives, Cambridgeshire (Statue of Oliver Cromwell, St Ives) and Warrington, Cheshire (Statue of Oliver Cromwell, Warrington).